Following the Russian Revolution in 1917, Russian entered a period of Civil War which continued until 1922. The so-called ‘White Russians’, loyal to the Tsar and Russian Royal Family, fought the Bolhseviks and were supported by the Allies. From 1918 British troops began to arrive in Russia and participated in the fighting as part of the North Russian Relief Force. They stayed until late 1920 when the last units left. 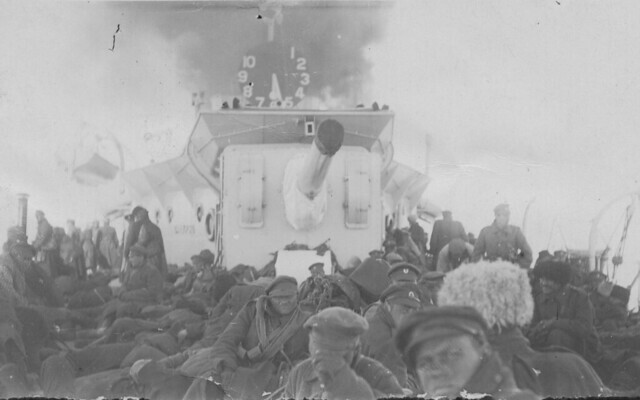 This image shows White Russian troops on board a Royal Navy ship off of Archangel in 1919. As well as ground troops the Navy was in support and units from the Royal Air Force also flew in Russia. This campaign was never recognised with its own medal but men who fought here, some of whom had never served on the Western Front or other Forgotten Fronts, were awarded campaign medals, in this case the British War and Victory medals, in recognition of their services in Russia after the guns had fallen silent in the West. This entry was posted on 19/10/2012 by sommecourt. It was filed under British Army, Great War, Russia, WW1 and was tagged with Archangel, North Russian Relief Force, Russia 1919, Russia WW1, White Russians, WW1. My paternal great-grandfather was in the navy serving in the Russian civil war. He was a Warrant Shipwright and served on the Askold (HMS Glory IV). Somewhere in the family is a pair of pictures of him and his ‘messmates’ in their uniforms at zero degrees and in their big, thick winter coats at minus 47!